Most people today know Thomas Edward Lawrence (1888-1935) by his nickname "Lawrence of Arabia" which was made famous by the 1962 film based on his life starring Peter O'Toole. If you've seen the movie, you'll recall the Lawrence was a Lieutenant Colonel in the British Army and played a pivotal role during the Arab Revolt against Ottoman Turkish rule starting in 1916 through to 1918. You may also recall that at the beginning of the movie, he is involved in a fatal motorcycle accident on his Brough Superior SS100. That wreck really did occur about two months after Lawrence left the military on May 19th, 1935 and he died of the injuries he sustained 6 days later. While alive, Lawrence was an avid motorcyclist. 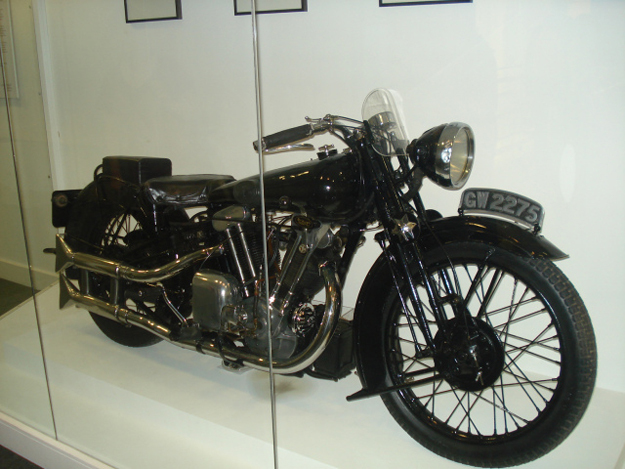 His brand of choice was the Brough Superior and he owned seven of them during his life. He nicknamed them his Boanerges, which is a biblical name meaning "sons of thunder". He also named the motorcycles George I through George VII and at the time of his death George VIII was being built at the factory. George VII, the bike on which he was killed, has been restored and can be seen at the British Imperial War Museum. An interesting fact about the Brough Superiors was that each bike was personally tested by George Brough, the owner of the company. The SS100 models were tested to at least 100 miles per hour, making them incredibly fast for their time. After his fatal wreck, Dr. Hugh Cairns, a neurosurgeon who attended Lawrence, began research into motorcycle related head injuries. The result of that research led to the use of crash helmets by both military and civilian motorcyclists.